VANCOUVER, BC--(Marketwired - December 11, 2015) - (TSX VENTURE: SOR) -- Sora Capital Corp. (the "Company") is pleased to provide a corporate update outlining its achievements over the past year. A private placement in Sora Capital was completed by Elevation Capital as its Qualifying Transaction (see news release dated October 30, 2015). This also included the Company successfully listing on the TSX Venture Exchange as an "investment issuer". As part of the transaction the Company is also pleased to announce the appointment of Mr. Larry Timlick to the Board of Directors. Mr. Timlick is currently Vice-President, Western Canada at Avaya and has previously served as the Territory Manger for Aruba Networks, a private technology company and as President of Triplet Management. For more about Larry click here. Mr. Timlick joins Paul Reinhart, Greg Hope and Fred Tajada on the board. Sora Capital's investment strategy focuses on emerging companies in the Software as a Service ("SaaS") sector of the technology industry, more specifically, companies with consumer facing products and services with revenue models, including subscriptions, transactional service fees and targeted advertising. Using the expertise of its management in both the venture finance and technology sectors, Sora identifies candidate companies in need of capital investment and operational support to continue developing their Minimum Viable Products ("MVP") and business plans. Typically, these companies require "seed capital" stage investments to continue the development of the MVP's, including enhancing the product into polished and competitive offerings, and to begin establishing a user base (customers) and monetization model. With that philosophy in mind, Sora has invested $1,000,000 and $250,000 in RosterBot and HelpHub respectively since the beginning of 2014. Subsequently the Company completed a Convertible Debenture financing with RosterBot for $200,000 (see news release dated July 17, 2015). RosterBot continues to assess and pursue various strategic initiatives and partnership opportunities in the development of its business. Sora is pleased to announce both companies are reporting they have continued to realize month over month record increases in users and engagement during the past 12 month period, with each company recording over 500% increases. 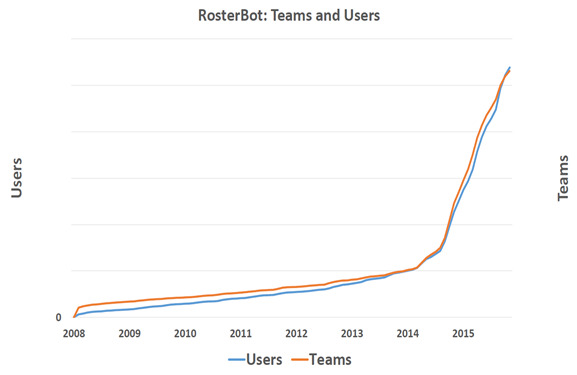 Over the past year, RosterBot has introduced a number of new features including WebCal/iCal Schedule Importer, Chirp messaging, printable rosters, enhancement to swipe and photos, a re-vamped payment feature, CSV schedule importer, Find A Team and a complete events and dashboard re-design. 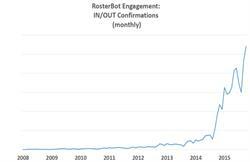 The impact of these and other advances made on the platform, both on desktop and apps, is being realized as confirmations along with "teams and users" numbers continue to grow, showing a 500% growth over the past 12 months. 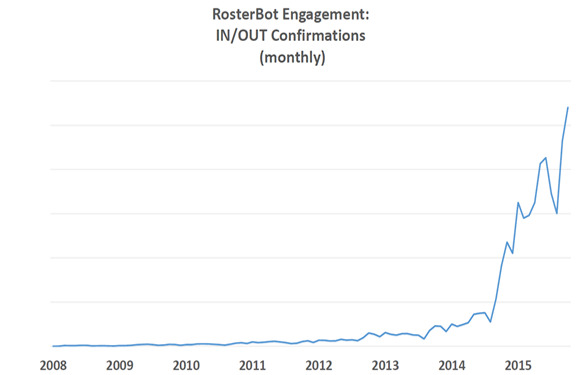 What is particularly noteworthy, while experiencing this rapid growth, the positive status among the users of RosterBot maintains very high levels as reflected in the 90%+ user satisfaction numbers and 80%+ retention rates. Both the iOS and Android apps continue to perform well in their respective stores with each app receiving high ratings. 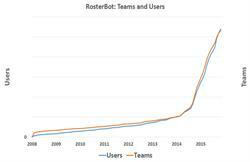 RosterBot looks forward to a promising future in the year to come and to continue to improve the platform and implement new features. Behind the stewardship of their founder Miguel Kudry, HelpHub was recently named as one of a select group of companies chosen to participate in an elite Vancouver-based Fellowship. The program is operated by The Next Big Thing, "an entrepreneur-led charitable foundation that empowers young founders to take on the world". "We're already seeing companies in our pipeline who are poised to compete on a global scale," said Meredith Powell, co-founder of TNBT. HelpHub's team will be working out of the Vancouver offices of Hootsuite for a three-month period where they will have access to additional resources such as planning and development, and introductions to funding sources. HelpHub continues to improve and expand their platform including advancements such as Tutor Academy, a set of resources and content for tutors to grow their tutoring business, learn about the best practices, academic honesty, and overall to get the most out of our platform. Following the over whelming success realized in 2014, the Alma Mater Society of the University of British Columbia is continuing their association with HelpHub, and their private label platform now boasts over 300 tutors available to assist enrolled UBC students. Users and transactions continue to grow significantly. HelpHub is a real-time open market connecting students and tutors anytime, anywhere. HelpHub enables students to instantly connect with experts in over 500 subjects, from over 60 countries. With whatever students need help-whether it's a five-minute session or an hour-long, recurring weekly session-HelpHub accommodates any schedule. HelpHub provides tools for tutors that allows them to manage, develop, and grow their tutoring business and also enables them connect with students via video, phone, in-person, and from their mobile devices. HelpHub is available on desktop or as an app for iOS devices in the iTunes store. The shares of Sora Capital trade publicly on the TSX Venture Exchange under the symbol (TSX VENTURE: SOR). Sora Capital Corp. has taken every precaution to provide the most accurate information possible. However, it is provided without warranty or claim of reliability. It is accepted by the reader on the condition that errors or omissions shall not be made the basis for any claim, demand or cause for action. The information and data were obtained from third party sources believed to be reliable, but we do not guarantee its accuracy. It is the responsibility of the reader to perform proper due diligence before acting upon any of the information provided. About this company Sora Capital Corp.